Of course I got way behind again in reading blogs. The end of the school year activities followed almost immediately after by our vacation didn't leave much time for browsing through quilt blogland. But now that I'm home I'm working on catching up on what everyone has been doing. Yesterday I saw that Val of Val's Quilting Studio has issued a challenge. She calls it the Piggy Bank Savings = Money for Quilting Challenge. While driving to work and then later to pick up the kidlets at summer camp, I thought about it and while I'm not going to follow her challenge to the letter, I thought that I could participate in my own way. You see...I've been hunting for a new purse for a very, very long time and still can't find one that I like. My old one has seen better days and desperately needs to be replaced. I've been using my Just Right bag when I can (I love it so) but it just isn't big enough for everyday. So then I got thinking that since this one turned out so well, maybe I'll just make myself a new purse. I've been hunting for just the right pattern but still have not found The One. If you have any suggestions, I'm all ears. Anywho....with this new purse to be I'm going to need a new wallet (the old one is shot too). I'm trying really hard to carry less and that is where the Piggy Bank Challenge comes in. What I've decided to do is to stop keeping my change in my wallet and spending it as I can (it makes it really heavy when it is full, don'tcha know) and from here on out I'm going to throw it in a jar and see how quickly it adds up. I wanted a really fun "piggy bank" to use and started thinking about buying one just for this purpose but that doesn't make sense since the idea is to save money, not spend it to save more. 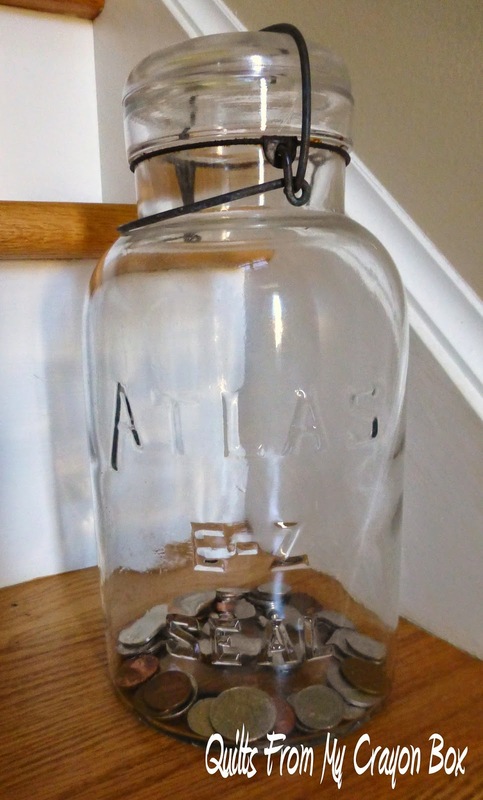 Oh well....if I come across something perfect at a yard sale at a real bargain, perhaps I'll get it but in the meantime I'm going to use this antique Atlas mason jar. I have a couple of these jars that I got at a yard sale years ago and although I haven't used it much other than for general decoration, I do love the waviness in the old glass. It really felt good to empty all that weighty change out of my wallet and though it doesn't look like much in the jar, that coinage weighed over 1/3 of a pound. I'm likely not going to keep my savings for the entire year before I spend it but instead will turn it in for bills once the jar is full and use the moolah for something on my quilty wish list. So there you have it, my own take on Val's Piggy Bank Challenge. I'm linking up with her post and you can too as it doesn't end until tomorrow. If you want to stop carrying around all that heavy change to, jump on board and start saving it. You never know just how much there might be and what goodie(s) you can buy with the savings. Have you heard of dogundermydesk? She has some great patterns! Love that mason jar for your spare change. Goood luck on that new purse pattern, there are so many beautiful ones out there I change every season. You are always so practical Michele! I love your Just Right bag.